1930s, beach, Intimate Strangers, J. M. Harcourt, marriage, Upsurge! Intimate Strangers is a portrait of marriage as a concept and institution more than a portrait of a particular marriage. Elodie and Greg’s problems in their marriage of fifteen years are set against the troubled relationships of those around them, especially virginal tomboy, Dirk, who holds a line of suitors in her sway, not wanting to marry any of them, but eventually yielding to one for money. On the beaches of Calatta and then back in the suburbs of Perth, Elodie contemplates running away with Jerome as Greg continues his dalliances and fails as a provider. Over and over, the novel circles around the questions of finding sexual and personal fulfillment in marriage and out of it, with sexual attraction pulling people away from commitment. There is no clear message; the appeal and the problems of adultery are both presented. The resolution has Elodie and Greg recommit themselves to each other at the same time as they applaud Dirk’s escape from her marriage. In the moral world of the novel, Dirk’s escape is permissible because the marriage’s oppression mirrored that of the capitalist oppression of workers; as part of that, her husband Ted was violent, leaving her bruised. Greg is not as bad as Ted, but by today’s standards at least, he rapes Elodie in Chapter 6. 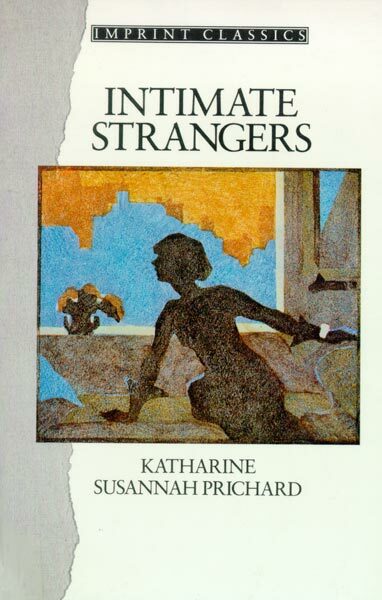 Intimate Strangers is distinct among Prichard’s novels. Most of her novels are researched, taking place among a particular occupation group – opal miners, timber workers, circus workers, station workers. Intimate Strangers is closer to the middle-class, urban world Prichard moved in. The urban setting is unusual for her, although as Throssell points out in the introduction, two of her lesser-known works, Windlestraws (1916) and Subtle Flame (1967) are also set in cities. Her other novels are also much more plotted; more than any other her other works, Intimate Strangers occurs within the characters’ consciousness, their inner conversations and impressions. However, just in case you were in doubt that you were really reading Prichard, in chapter 19 Dirk and Elodie turn up to a rally of unemployed workers in Fremantle to hear Tony speak, and the speeches of a number of the unemployed are reported. The tumult of the Great Depression is not foregrounded, but intrudes most here and when Greg loses his job in the downturn. The novel is drenched in seawater and sand, lovingly evoking Perth beaches in the amalgam place of Calatta, part Rockingham, part Cottesloe. The characters begin on holiday there for the first half of the book, and return a couple of times, including for the final resolution. All the characters live to swim or sunbake or walk along the beach or fish. It is a valuable picture of Western Australian beach culture in the 1930s, sitting alongside J. M. Harcourt’s descriptions in Upsurge! (1934). While avoiding simplistic autobiographical readings of Intimate Strangers, it is an anguished book from an anguished period in Prichard’s life. The characters’ ponderings on how to find happiness and satisfaction in life and particularly marriage are themes which resonate today as well, even if the novel reads as a product of its age. It is not the Prichard novel I’d recommend readers start with, but it is a significant work in her corpus, demonstrating her versatility, and shedding light on its context.